1) Fold your t-shirts & store vertically - this is what Marie is famous for & it makes sense, as this way, you can see exactly what you have and you're more likely to wear them all, instead of forgetting the ones that are at the bottom of the pile. Here's the video to show you how to fold them. (Not so sure about communicating with your clothes whilst you do it, but it's your call!). 2) Use boxes to separate items out in your drawers. This makes it much easier to keep things tidy - ie: you could separate out a t-shirt drawer into different boxes for sports t-shirts, undershirts, printed t-shirts and plain. And it's also great to keep smaller items tidy like belts, underwear, ties, socks etc, or you could even do the same for larger items on shelves too as they've done in the image above. 3) Fix wire baskets inside hall cupboards or your wardrobe for gloves, scarves, hats, folding umbrellas etc. 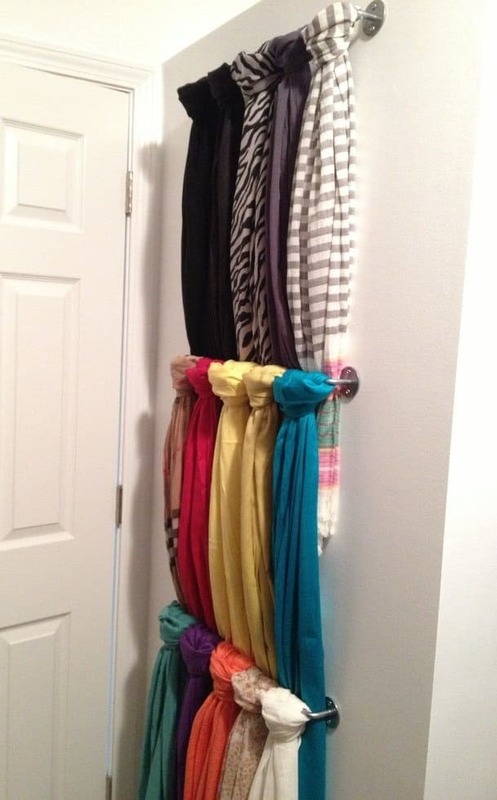 This makes your accessories much easier to organise and find rather than having them on a high shelf where they get pushed to the back and you're unable to see them, or losing them when you leave them in pockets or bags. 4) If your shoes are in a heap at the bottom of the wardrobe invest in some Muji drawers to store them neatly under your clothes. Use a stack of the shallow, medium ones to create a chest of drawers within a cupboard or you could use one of the larger shallow ones to store shoes under the bed if you're short of space. 5) Lots of scarves? Have rails fitted to the inside of your wardrobe to hang them. This saves on drawer space if you're short of it and keeps them neat so you can see what you have. And if you first need to edit your wardrobe, then have a look at my wardrobe edits for men. Not only can we streamline what you have but make up outfits from the remaining items and put together a shopping list, so you can either shop on your own or book a follow up personal shopping trip. Either way you can focus on exactly what you really need, rather than buying more of the same.